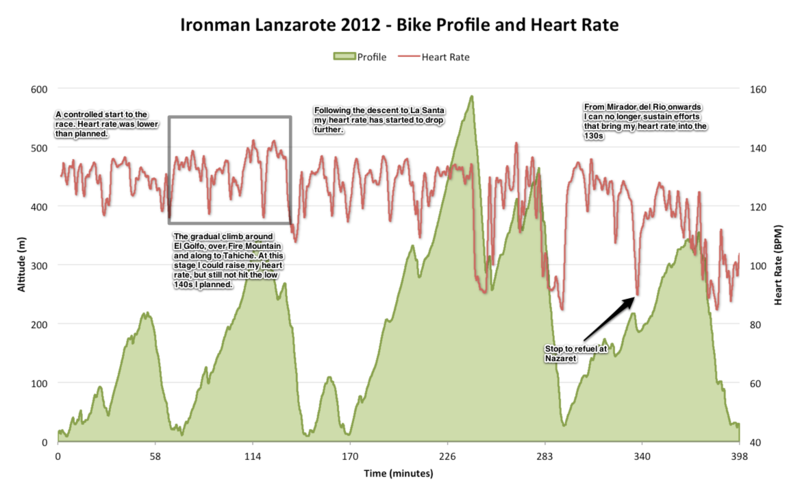 Tempting as it is to pretend that, despite sore legs and peeling sunburn, Ironman Lanzarote never happened I need to dig deeper. I knew the lack of consistent, specific training would cost me on race day, but the worst case scenario that played out leaves me genuinely concerned about the season ahead. Am I that far off the mark in assessing my own fitness or did poor preparation and a collection of small mistakes amount to my slowest Ironman? I am unlikely to ever know the answer, but picking through my race data may bring me a step closer to the truth. The race was controlled – I kept my pace in check and my heart rate down and I managed my nutrition, swigging gel every quarter hour. Yet the bike data shows the pattern of a poorly executed ride, as if my initial efforts – with heart rates in the low to mid 130s – were too much, or I’d failed to consume sufficient calories. The former seems unlikely the effort felt comfortable, too easy and the pedestrian heart rate backs this up, but the latter? I genuinely felt I was managing my nutrition well, taking in a minimum of 200 calories per hour; low, but enough to sustain me further into the race than it did. I have to concede that nutritional errors were the most likely culprit; that the debt I was building was greater than I thought and hit earlier than expected. This was simple stuff. 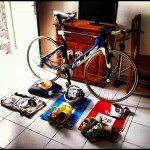 It reflects on my mindset during the race – my plan was built around using up an old box of gels. Given my intention was to race steadily there was the potential to take in and absorb more nutrition. Being undernourished was a problem that should never have occurred. Perhaps a couple of bars would have made the difference between struggling home and maintaining a steady pace. By the time I started the run I was already dealing with the consequences of my nutritional short fall. If the slow walk through transition was any guide I was looking at a long day ahead of me, but running proved surprisingly easy and instead I had to reign back my speed. My run fitness was much improved, but I also knew that my endurance was underdeveloped; I doggedly stuck to a run/walk strategy with each aid station as a break, conservation remained key. After two hours fatigue took control, heart rate and pace gradually declined until, finally, one walk break extended beyond the aid station. All that remained was a determined march towards the finish line, jogging from coke to coke. The assessment of my run is easier. My run training is incomplete and while I’ve made huge progress since last year there is a way to go before I effectively run an Ironman marathon again. There are positives – the way I held my form together and the quality of the first lap in light of all that had gone before. It would be an oversight not to reflect on the quality of recent training. 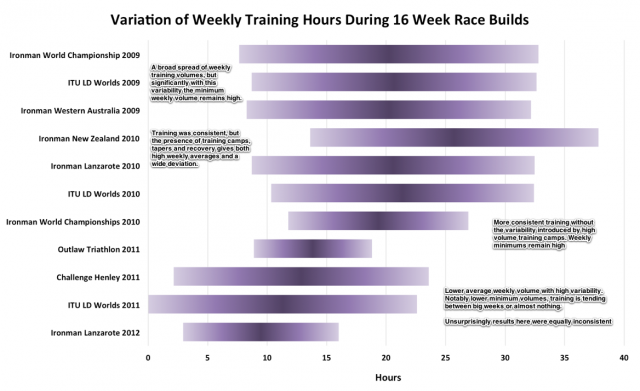 The chart below shows the variation in weekly training hours during a selection of builds, this race stands out for it’s distinctly lower profile. 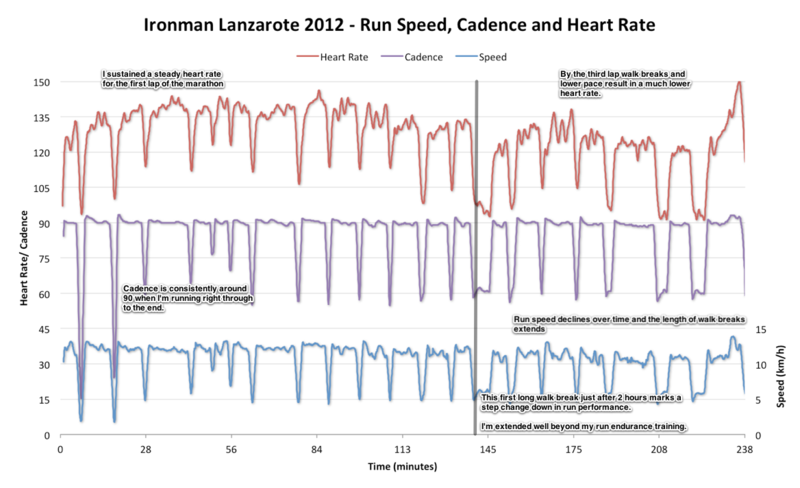 I had scaled back my racing goals in light of the significantly lower training volume of recent months. It would be unrealistic of me to expect or attempt to match the volumes I sustained in 2009 and 2010, but last year demonstrated I can still do enough to perform well. So the fundamental problem is I have neither trained sufficiently nor consistently enough to perform near to the potential that averaging ten hours per week might allow. The single biggest improvement I can make is to train regularly! Mistakes were made on race day, but it really comes down to the quality of preparation. Both during the months before and my organisation around race week. I didn’t place the focus on the race that was needed and suffered the consequences. Rather than a controlled day, my race spiralled out of control resulting in a performance far short of my potential. Next time, in Roth, I need to be on top of my game; I’ve got a month to sort things out.